"I usually turn the channel when I see commercials about starving children. It makes me too sad. But something about what you are doing touched me and I want to help. I am only 16, but I think that I have to do something. I have to help these starving children." Emily A. 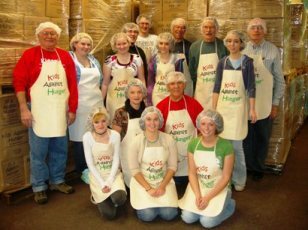 Because Kids Against Hunger is a volunteer-driven effort, there are many ways to help. Of course, the easiest way is to make a tax-deductible monetary contribution. we rely completely on donations to purchase all supplies and ingredients from vendors, and could not exist without the fianancial support of individuals, corporations, schools, clubs, and people like you. 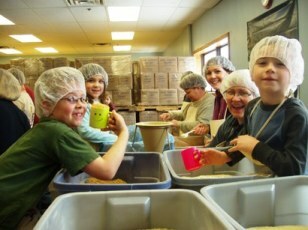 On average, each volunteer packages close to two boxes of food in a two-hour session. At $0.25 per meal, that equals $80-$100 worth of ingredients. We want to give everyone the opportunity to package our meals, but the reality is that we must also cover the cost of the ingredients. Like many nonprofit organizations, we are suffering from the effects of the current economic downturn. We realize that the donation of your time is very valuable, and don’t want to turn anyone down for lack of funding, but we have found that it is possible for each volunteer to raise at least $25 or more by asking their family, friends, and/or neighbors for support. Think about how often you use a search engine to search the internet. Wouldn't it be nice if you could support your favorite charity while doing so? Well, now you can by making GoodSearch your default search engine and choosing Kids Against Hunger-Sioux Falls as the default charity. You can also shop online at GoodShop (choose from more than 500 great stores incl. Amazon, Best Buy, Dell, PetSmart, and Wal-Mart) and designate Kids Against Hunger-Sioux Falls as the charity to receive a portion of the purchase price. It's that easy!